I’ve noticed a bit of a renewal for Pokemon Go thanks to large improvements by Niantic starting with Generation 3. 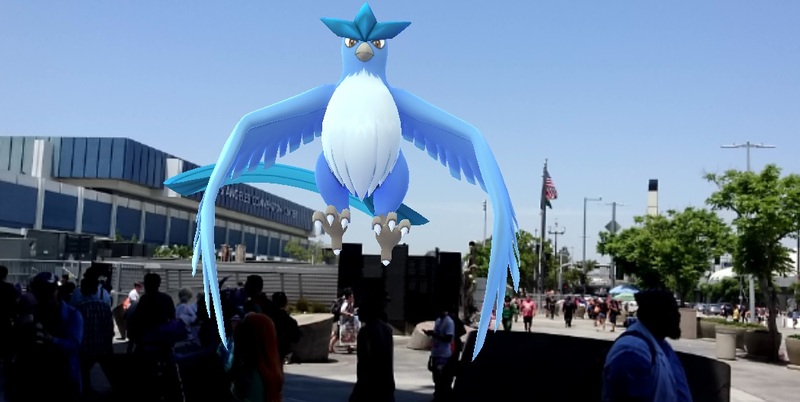 With raids, quests, real-world weather affecting spawns, trading, and friends, the game’s drastically changed since release. But as my fellow Massively OP reporters Brendan Drain and Tina Lauro Pollock have both returned to the game, I’ve also noticed that coming (back) to the game can be a bit confusing. There are a lot of in-depth guides out there, but there is so much going on with the game that for a real newbie, it’s easy to get overwhelmed. Instead, I’m going to go point by point, top priority to bottom, in a way that lets you get back into the game quick and easy, using long-term but relevant tips and resources. Power players and veterans can skim these articles and add their own advice in the comments section, but my job is going to put you on the road to being a capable Pokemon trainer. Today, we’re going to start with community. You may be asking yourself, “Andrew, why are we talking about finding a community before gameplay?” Because we’re talking about Pokemon Go as an MMO. While we’ve all played MMOs on our own, MMOARGs (especially Niantic’s) tend to be more like old-school MMOs: The content can be rather thin, but the community fleshes them out. Think more sandbox than themepark MMO. You can make some fun content solo, but the community can really add to that. It’s more than that, though. For rural and even suburban players, community is incredibly important, as you may need other players’ help via friend codes and gift exchanges just to keep a decent stock of basic supplies. Friends can send each other gifts, which contain supplies like Pokeballs, potions, revives, and even (at the moment) eggs with unique (but rather useless) Pokemon. If you or your friend opens a gift, you’ll gain “friendship,” or reputation with him or her. Doing this, trading, or raiding together once a day will increase your friend level, making trading cheaper and raiding easier and more profitable. That’s the least of it. Being part of a Facebook group, Discord channel, or other social media group based on the game will not only get you friend codes but increase the likelihood of your meeting other players who will hopefully fill in the gaps of these guides. The problem, however, is that some groups worry about spoofers, people who use TOS-breaking apps that let them play in Germany from their house in Hawaii. They ruin the local gym meta, so some groups keep their information more grounded in the local community rather than on social networks, meaning you may actually have to find people physically. So, how do you find the equivalent of your guild? Well, you could read my article on getting into the communities, or just follow some simple advice. You can Google or check social media for a local community, or check The Silph Road’s league tool and hope there’s a local group. That’s the bare minimum. They may be big, zerg guilds where you’ll get lost, but it’s a start. If there are no groups, or none you feel comfortable with, you need to advertise you’re playing and hope someone takes you in (assuming you’re in a safe place). That’s the short end. The long end starts out with choosing a faction: Mystics (Blue), Valor (Red), or Instinct (Yellow). As in EVE, Darkfall, Asheron’s Call, or any other PvP MMO that has limited fast travel and localized banking/trade, your real life area may have a vastly different meta than what you read about online. While release saw Mystics as the biggest group and Instinct as the smallest, this may be changing, and it may be quite different where you live and play. My advice? If you’re playing with friends, ask for their advice. It’s much easier to play together because you can help each other out, but they may have reasons for you to suggest another faction. If you’re alone and have no idea, don’t care about color, or don’t care about which Pokemon is in each team’s symbol, consider their philosophies: Mystics (Blue) are research and data-driven. Valor (Red) is about strength and training. Instinct (Yellow) is about eating glue going with… your… instincts. If all else fails, look at the color of the local gyms while you’re playing and note who seems to be the most and least popular. 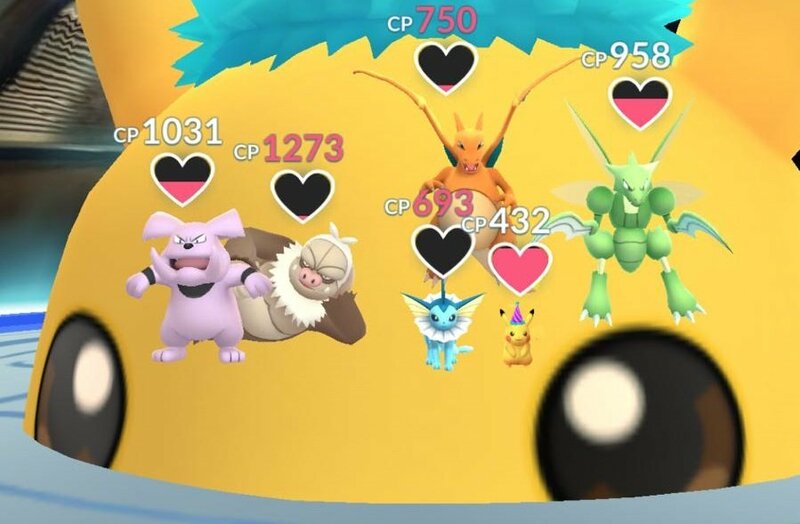 The most popular team means there’s probably more people willing to help you and you may be able to get into gyms more easily without having to battle. Being on the least popular team means that if you can find that group, they may be more close-knit. It also means you can fight in gyms to open one up, as the biggest team may fill up gyms, preventing others from getting their daily coins. Just know that the least popular team often needs to fight the hardest. Now, let’s say you’ve checked the Silph Road, social media, and talked to friends/family and still don’t have a community. As in any old-school MMO, you just have to get out there and play. Unlike an MMO though, in POGO people can’t easily tell you’re playing the game, much less that you’re “unguilded.” Having an external battery for your phone is one of the signs that someone’s playing the game. Having the Pokemon Go Plus (think offline skill-ups) worn on your person or even just held on your hand helps advertise and helps you get monsters and resources without having to actively play. General Pokemon swag works too. If any of that sounds embarrassing, Fangamer has a collection for you. We don’t make any money off that plug, but the company does do some low-key gamer clothing that I personally get lots of compliments on from non-gamers. The above link’s clothing has strong enough references that a Pokemon player to know you’re one of them, but is “normal” enough that people will ask you where the gym is located (if you’re shy, say, “Kanto,” which is actually the setting of the first game and the eastern part of Japan, so you’re not technically lying or outing yourself as a gamer!). With swag and gear on person, simply choose a location to play. Neighborhood parks are fine, but I’d recommend finding one with lots of PokeStops and/or Gyms, as it means at least some Ingress players have visited it. Try to stay local, especially as a new player, rather than going to hotspots unless you’re desperate to participate in a group event. Shopping centers work too. Starbucks and/or Sprint in American or McDonald’s in Japan are often a Pokestop or a Gym. Gyms tend to be better. Maybe relax there awhile if you’re desperate to find players (more on that later). I do not recommend large, well-known hunting grounds, as those attract everyone. It’s like setting your Hearthstone in World of Warcraft to Orgrimmar instead of Thunderbluff. Everyone’s in Orgrimmar, so you’re never alone, but you probably can get to know Thunderbluff residents more easily. Local is best, especially if it’s near your home, work, or place you intend to play often. Remember, you’ll probably have to drive to a bit to make raids or capture rare Pokemon people report. As the game controls most of the time factors, you want to cut down on that as much as possible. Active vs. Inactive Gyms. Click to zoom. 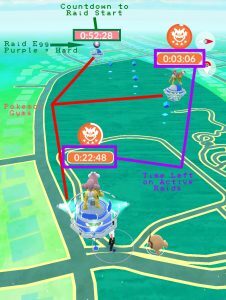 Gyms with an egg on top means there’ll be a raid there, and those are prime locations for meeting other players. You can try attacking the gym, see whom it brings, and/or wait for the countdown to expire and see if anyone comes. It’s a lot like waiting outside of a dungeon in an MMO, though I probably wouldn’t waste too much time standing around after, say, 15 minutes or so. You can check the lobby for other players, as you may not physically see any. They could be spoofers, or they could just be on the other side of the building. The number next to the “Battle” icon indicates how many people are inside. Lures are another useful tool. Placing a lure on a Pokestop may attract other players. These are given to you for free at certain levels, but they also cost money. It’s your choice, as it can be a crapshoot. I’ve attracted people with lures to a local park, but no one really wanted to talk. It may be best to do this during an event, but we’ll cover that later. This one’s a bit of a gamble and a long-term goal, but aim for getting an EX Raid pass. These are awarded for doing gyms at sponsored locations and parks. University campuses can also work when the former aren’t available (but if you know any local players, ask them, “Which gyms are EX Raid eligible?” and they’ll help you out). 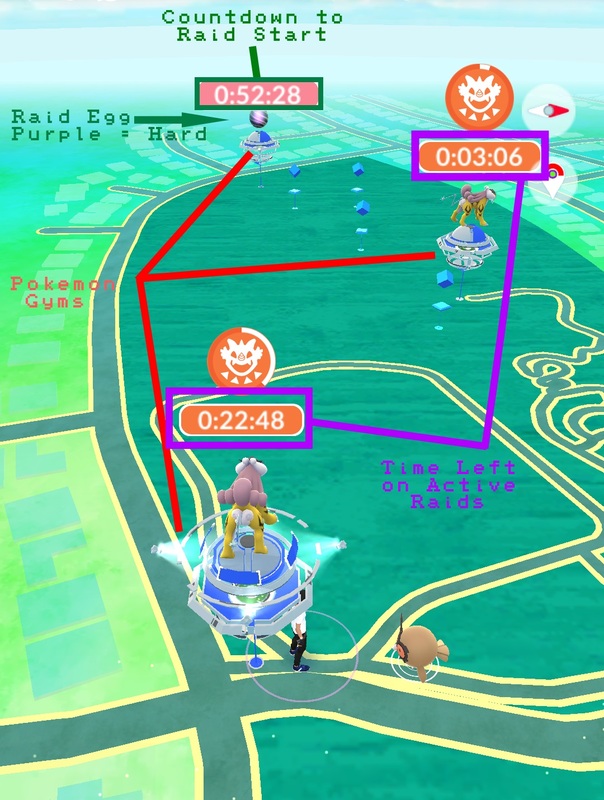 EX Raids are special events, and sadly you might not be able to make all of them. It’s frustrating. However, you’ll often find other players there. If you don’t find your local community group at an EX Raid, that’s also a great place to start one! Massively OP’s Andrew Ross is an admitted Pokemon geek and expert ARG-watcher. Nobody knows Niantic and Nintendo like he does! His Massively on the Go column covers Pokemon Go as well as other mobile MMOs and augmented reality titles! I was looking at the top earners for the iphone the other day and was a little surprised to see Pokemon sticking in the top ten like glue. While the supercell games have fallen out of favor lately Poke is still hanging tough like TNKOTB. Maybe they didn’t squander their early fortune after all.